Ok I admit it I can’t deal with Yom Kippur. I’m sorry for my sins and all but fasting is pretty much my worst nightmare. If the old man synagogue breath isn’t bad enough, I’ve actually never made it through the whole day fasting. I lie every year and tell my grandma that I “fasted well”. You may remember my old post here about ‘fat moments‘, or moments where I’ve acted, quite shamefully, like a complete fatty. Today is the Yom Kippur edition. One time I made it to 3pm without eating. Whilst my mum was tutoring maths to my cousins I decided to bake cupcakes for the evening. I proceeded to make the batter… a little taste here, a little taste there… before I know it there was hardly any batter left. I threw the rest away and my mum never knew I even started making cupcakes. My rationale is that God turns a blind eye to uncooked foods…. he would do the same in my position. The following year I made it successfully till about 4pm. I was starving but felt skinny. I went upstairs to have a nap and my dad had left an M&S Halloween ‘chocolate bucket’ (the best type of bucket) on my bed. I ate one, then two, then the whole thing (about 4,000 calories). I fell asleep in the midst of the glimmering foil. It was the best sleep ever. One time I was chewing gum in front of the Rabbi and he told he that I had technically broken the fast. So I went home and binged. May as well throw the baby out with the bath water and all. 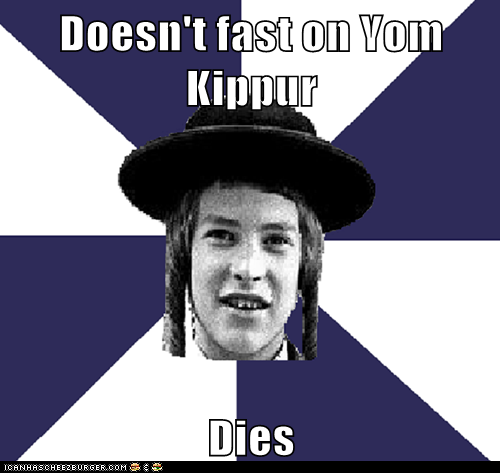 Do you have any Yom Kippur fat moments? As my grandma would say… Fast Well!! 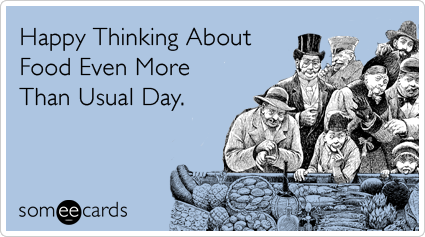 This entry was posted in Lols and tagged dieting, festival, jewish, yom kippur.